Every now and then, a film will come along that changes cinema as we know it. Goodfellas. The Blair Witch Project. That One With The Blue Aliens That Was Really Pretty in 3D. And now, there’s another film we can add to that list: Sharknado. Yes, Sharknado. The one with the tornado made of sharks. Low budget B-movies have been around forever, but they never achieved mainstream popularity until Sharknado. 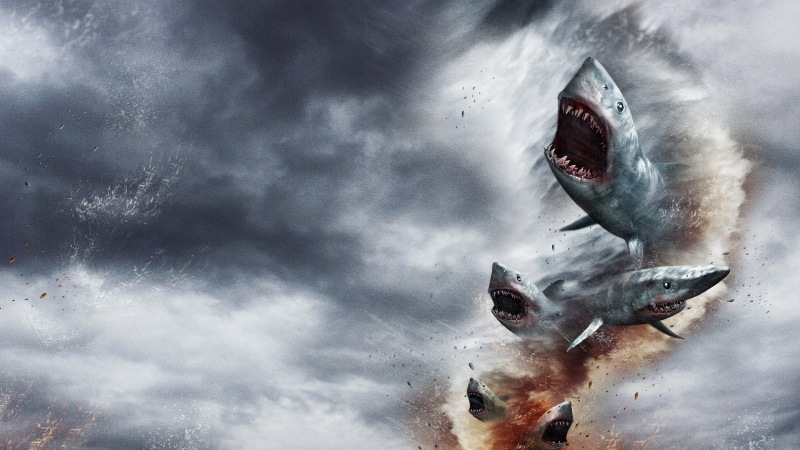 Sharknado and its swirling deathstorm of angry fish has paved the way for a veritable avalanche of trashy monster movies, including classics like Mega Shark Versus Mecha Shark, 3-Headed Shark Attack and Zombeavers. Sharknado wasn’t the first movie about killer sharks, although it was the first to combine the sea’s deadliest creatures with a natural disaster. This potent combination sent Twitter into a frenzy, catapulting Sharknado into the public consciousness and setting it apart from its monster movie counterparts. Ultimately, it proved that you don’t always need a huge budget to make a movie a huge hit. Especially if said movie is about flying death sharks. If you believe some people on the internet, humanity has run out of new film ideas and we’re doomed to sequels and superhero movies from now until the end of time. And yet, here you are reading about a film that – and we can’t emphasise this enough – is about a tornado made entirely of sharks. Not only is Sharknado proof that originality isn’t dead, it’s a testament to the human imagination. One day, someone sat down and thought “hey, what if there was a film about a shark tornado?” Then they told someone else, called Tara Reid and made it into a film which made them unbelievably rich. Sharknado’s success is an inspiration to anyone who has ever sat on a bus and daydreamt about making a film about a robot bear fighting a dog made of fire, or a city being attacked by a 50 foot tall ironing board. Anything is possible, my friends. Anything. Back in the 70s, when people apparently didn’t really understand that movies weren’t real, Jaws scared people so much that they refused to go swimming. Since then, the public’s perception of sharks has softened through a series of documentaries and scientific facts like there being a 1 in 3.7 million chance of you getting killed by a shark (you’re more likely to get struck by lightning or hit by a firework). The final straw came with Finding Nemo, in which sharks are misunderstood, sensitive souls who cry at sad stories. Thanks to Sharknado, sharks got their edge back. As well as haunting the water, they now fly down from the sky too. Some scientists even say a real life sharknado might just be possible (although admittedly unlikely…). And now, for the first time in forever, there’s an actual scary movie about sharks in the cinema. Nice job, Sharknado (and the people who made The Shallows, obviously…). You can find all of the Sharknado movies, including the brand new Sharknado 4: The Forth Awakens (now available to pre-order), on the musicMagpie Store. Great prices, FREE delivery and flying sharks – what more could you ask for? ← This week’s new DVDs: The Big Bang Theory, Legends of Tomorrow, Narcos and more!